ACTION ALERT – PLEASE HELP TO BRING BENJAMIN HOME!!! THESE PICTURES ARE BEING CIRCULATED AND IT IS HOPED THAT BENJAMIN WILL BE RECOGNIZED AND RETURNED SAFELY HOME. AT THIS TIME – HE REMAINS MISSING. Please post widely everywhere, via email and social networking sites. 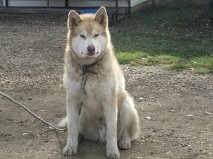 This is to confirm that our Benjamin, a Giant Alaskan Malamute is still missing from Falher, Alberta. I am including pictures to add to your publication. It is our hope that the reward $5000.00 will go to helping many others. Please share with your contacts! We are desperate to find Ben. ….. 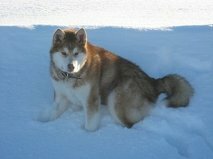 It is with saddest heart that I confirm that with all the posting, advertising, and all the things we have done right, we have not found our beloved best friend Benjamin. It kills me every day….the guilt is almost unbearable. I would do anything to have him home. Please repost…..we try to find him….with the help of advertisers, and the social media. Ben has tattooes in both ears….OXB and U26. He is very tall…..28 inches at the shoulder, and 108 pounds. Ben has the vocabulary of a two year old child and is especially bright. Ben has had extensive training. He understands the regular commands, but unusual that he knows lie down, roll over, speak, say hello, and gee and haw. Thank you for continuing to post our most valuable thing in the whole world to us. Benjamin is our child, and our child is missing. Sincerely, Jocelyn from Falher, Alberta. 780-837-1049. My heart goes out to Jocelyn and family…. all my hopes for Ben`s safe return home! Ben has been missing for a very long time. I cannot even begin to imagine what this family continues to go through…they have done everything humanly possible to try to find him…..the hardest part is not knowing…..
Please,keep bringing info about your dog to every possible place.Including churches, schools and his own breed rescues and groups in Canada and US.This is the first time I know about him.Have you ever considered consulting a dog communicator that could work with lost pets? For some people may be a stupidity but others may see it as a possibility. I wish you can find him healthy and happy.Please, do not feel guilty.We are not perfect. Everyone commit errors.But, everyone is where it’s meant to be also. Calm yourself,be in peace.Love never cease to be. Keep helping others while you look for him and do it in his name.This will help him and will help everybody.This recommendation I received from a buddhist teacher many years ago. It brings peace to the soul.